The first cohort of Clinical Excellence Queensland’s Healthcare Improvement Fellows graduated today. The Fellowship has been created to build tomorrow’s clinical leaders with a program focused on developing diverse skills in clinical leadership and service improvement that can be applied longer-term in local workplaces. The three graduates: Dr Michael Tresillian, general physician, and Dr Jacqui Marks, an emergency physician, are both from the Royal Brisbane and Women’s Hospital, and Michelle Padget is a Nurse Unit Manager at Princess Alexandra Hospital. The trio are now reflecting on their career paths and how to integrate these learnings into their clinical roles. At the presentation ceremony today Dr John Wakefield highlighted that the Fellowship was just the beginning for the graduates. "The Fellows will continue to bring their experiences and insights back to frontline patient care and will be integral in driving improvement across the healthcare sector. They will also continue to work with Clinical Excellence Queensland in the delivery of the 2019 Fellowship," Dr Wakefield said. Check out the second cohort of Improvement Fellows who started their 12-month Fellowship in February 2019. The Fellows welcome questions and conversations on your improvement ideas. To open a dialogue or find out more about the program, contact the support team. 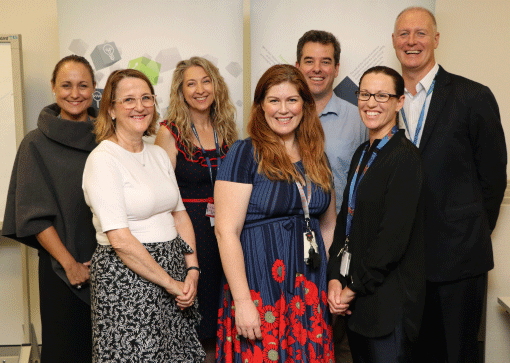 PICTURED ABOVE (L-R): Melissa Marriott, Ann Mealey, Linda McCormack, Dr Jacqui Marks, Dr Michael Tresillian, Michelle Padget and Dr John Wakefield.